Vegan Korean Tacos you can make at Home! 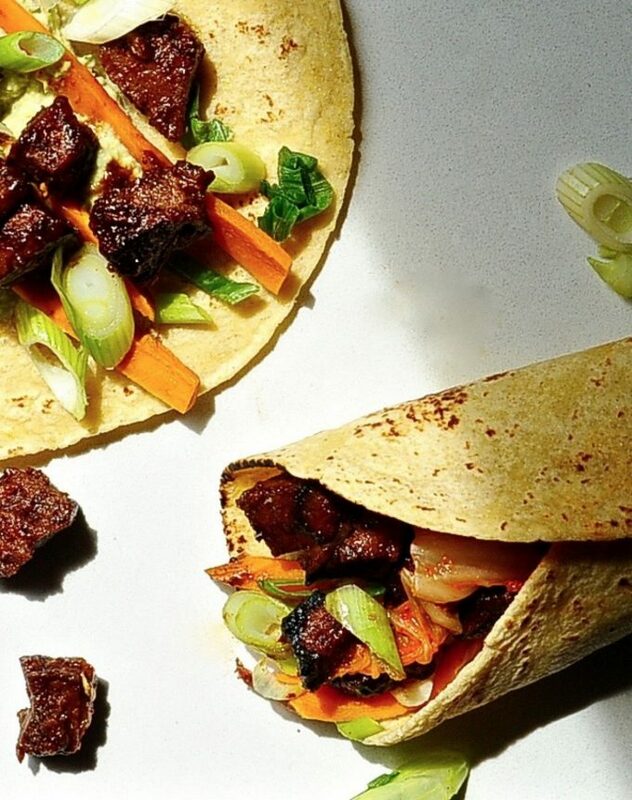 Vegan Korean Tacos, are a party of layered flavors and textures. Vegan Korean tacos are what my guy ordered when we went out to eat at our favorite joint last month. I stole a bite and thought they were… meh. I knew I could do better. Here is how I make mine. First I warm good quality corn tortillas, then layer on a generous smear of edamame-avocado spread, next comes yielding sweet potato, scallions, and morsels of slightly charred seitan in a sweet and spicy Korean bbq sauce. 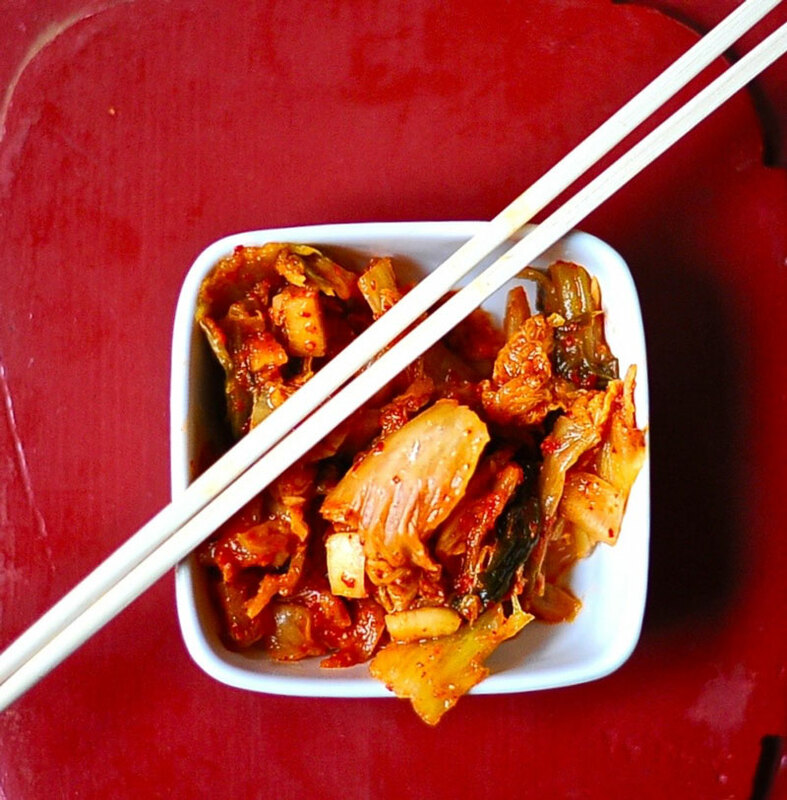 To top it all off, literally, for sparkle and crunch, a hearty dollop of kimchi. You know that climactic deli scene in When Harry met Sally? Well this Vegan Korean Taco is what she was having. “Mom, at some point do you just stop caring?” asked my teenage, daughter as we walked up our hill at a good pace on our way to eat lunch together. There she strode next to me, dewy skin glowing in the afternoon light with a huge purse that contained everything a girl might need in a fashion emergency. And there I strode next to her, crow’s feet spreading across my cheeks, dewy skin but a memory, a credit card in my back pocket and no purse. Man’s desire for the approval of his fellows is so strong, his dread of their censure so violent, that he himself has brought his enemy within his gates; and it keeps watch over him, vigilant always in the interests of its master to crush any half-formed desire to break away from the herd. I don’t believe I exhaled once in public in my 20s. 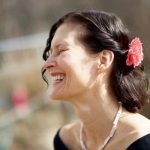 I worried when my husband would lovingly brush my hair back to kiss my forehead, sure that my carefully arranged hair was now a mess. I can’t tell you the times that getting ready for a party Hanaan would find me sitting on the floor with discarded outfits strewn like casualties across the battlefield of my confidence. “I can’t go” I would wail, “I’m too, ___(insert negative adjective). Stepping into a party was like facing a panel of Eastern European judges. These days all I need is 15 minutes to get ready for a party: 5 minutes to make coffee, 5 minutes to change my clothes and brush my teeth and 5 to sip my coffee. I would rather live in an ugly house and look at a beautiful one across the street every day than live in a beautiful house and look at an ugly one. 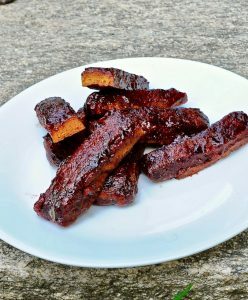 Seitan makes so much possible like my Bbq Vegan Ribs in sticky tamarind bbq sauce. 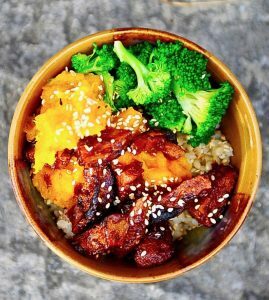 Or this healthy Teriyaki Squash Bowl. A festive take on everyday soft tacos. 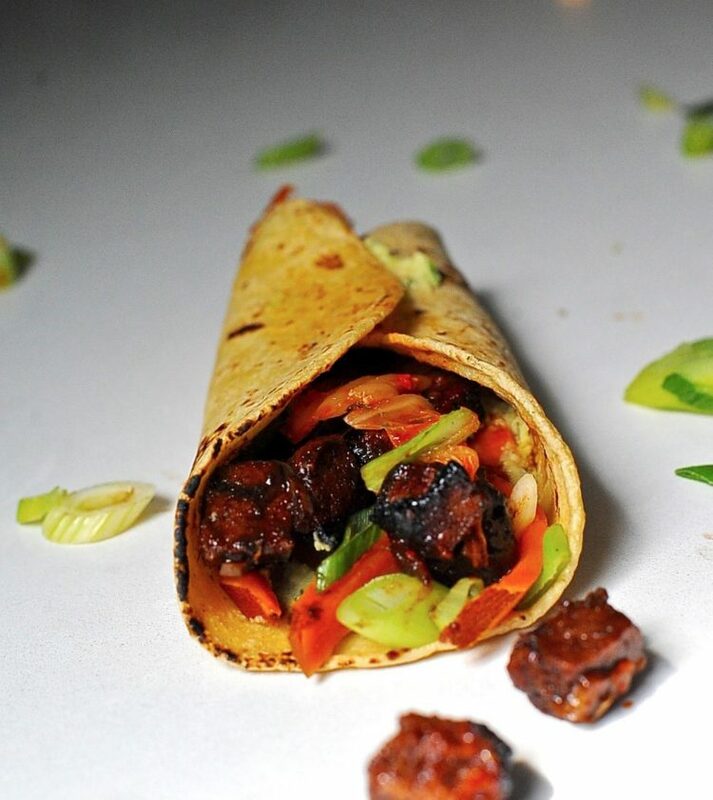 Smokey Bbq seitan, spicy, crunchy kimchi, smooth edamame hummus, and sweet potato spears come together in soft corn tortillas to make the perfect summer meal. Feel free to save time and use your favorite store bought seitan. In a blender place tomato paste, tahini, soy sauce, liquid smoke, nutritional yeast and broth. Blend until smooth. Once cool enough to touch cup it into the sized chunks you wish for your tacos. Place all of your sauce ingredients into a sauce pan and simmer on low, stirring occasionally. At some point in the next 20-30 minute you will see that the frenetic little bubbles have turned to slow and lazy bubbles. You are close. Once the sauce coats the back of a spoon turn off the heat. Turn the broiler (oven grill) to high. Place your cut up seitan into an oven safe pan. Pour the bbq sauce over and the seitan and stir to coat. 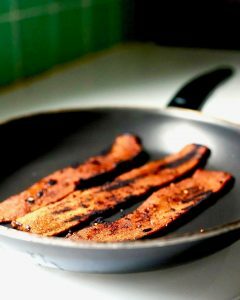 Place your pan of seitan under the grill on the top rack of your oven and broil on high until the seitan has gone all caramelized and a bit charred around the edges. 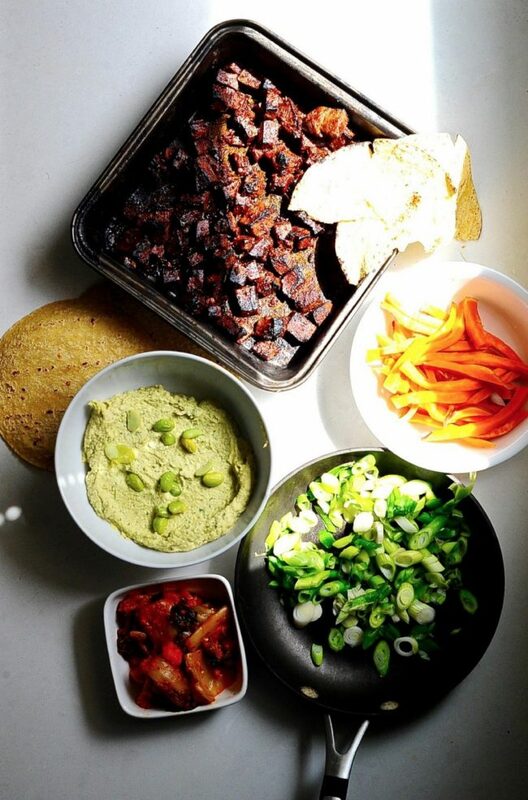 Now you assemble your tacos, a smear of edamame hummus, some seitan, a few spears of sweet potato, a sprinkle of scallions and a dollop of kimchi. Sweet potato I am so surprised! Mouth-watering! I sometimes make a wrap that looks something like this for your neice’s lunchbox. We can’t get seitan up here, so I cube firm tofu and saute it in a hastily made sauce that combines store-bought bbq sauce, soy sauce and sesame oil. (Your made-from-scratch sauce looks infinitely better.) 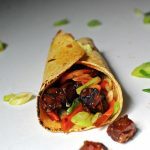 These wraps bear no resemblance to the standard lunchbox fare of her classmates: open-faced salami or cheese sandwiches. But things are changing. When she started first grade with a bento-style lunchbox (a start-of-school gift from our mother), her varied (vegetarian) lunches stuck out like sore thumbs. Now, six years later, lots of kids bring compartmental lunchboxes (containing interesting goodies) to school, and there are two other professed vegetarians in her class. I remember that when Papu first moved to Nantucket he couldn’t find a bagel on the island even at the supermarket and rice was in the ethnic section. Lol. White bread peeps. Seitan can’t be had in some countries but vital wheat gluten is available in almost all, even Norway. That is why my recipe is a recipe to make seitan. It is such a simple process and super cheap. Does she still use that bento box? I remember it was held together with an elastic band when I came to visit 5 years ago. Aha! I will look for wheat gluten. That bento box is still in one piece. She got so worried about it falling apart one day that I got another one just like it – same brand and style, but different color. Now the old one is her back-up. Phew. There are some seriously bold, bright flavors going on here, and I love all of them! Fusion food gets a bad rap, but I think this dish would set anyone straight. I’ve gotta try your recipe asap! Thank you! A virtual taco party Hannah? I’ll bring the kimchi. Amazing! Unlike some restaurants and food trucks that attempt fusion cuisine, this is the real deal, with such vibrant, bold flavors! I’m lucky enough to live by multiple Korean markets, so gochujang is easy to get it. Didn’t have time to make homemade seitan, so used some storebought stuff—will make it from scratch next time. Probably tempeh could work as well. Just discovered your blog. You’re the best! Thank you for taking the time to read and cook from the blog. It is people like you who make me want to run to the kitchen and get experimenting! Tempeh works well in this dish you are right. It sounds like you live in a fabulous neighborhood. Keep in tuch. You are a dream wife, diligently recreating veg versions of your husband’s former carnivore favorites into ones of the vegan variety. 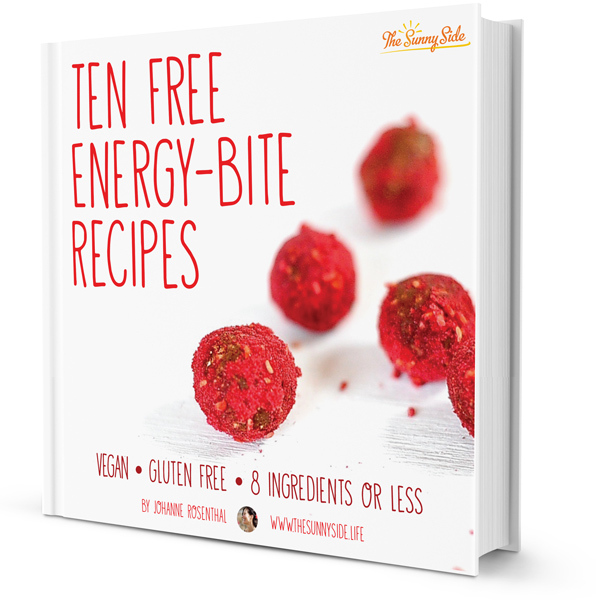 Equally impressed with your literary excerpts as with your deliciously creative recipes! Kudos on a delightful blog! Anita, thank you! I appreciate the positive feedback. I just jumped over to your site and am most inspired by your journey.